Kim Sheridan grew up with animals as her constant companions. Each time she faced the death of a beloved animal, along with the pain came the same questions, to which she could find no answers. Then, mysterious things began to happen that she couldn’t explain, which led her on an incredible journey to uncover the truth. Along with her own extraordinary experiences, she compiled heartwarming and meaningful true stories of everyday people around the world, and discovered compelling evidence that forever erased her own doubts about an afterlife for animals. 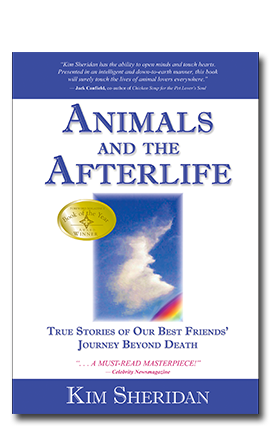 This book provides enormous comfort and reassurance to anyone who has ever cherished an animal, and food for thought for anyone who has ever questioned the place of these beloved creatures in the larger scheme of things, both here on Earth and beyond. Kim Sheridan is a highly respected and sought-after expert on life after death for animals. She’s an acclaimed lecturer and workshop leader, providing support to those whose beloved animal companions have passed. A popular guest on radio and television, she’s the founder of Compassion Circle, with a mission to expand the circle of compassion to all beings. She lives in Southern California with her husband and their beloved animal family.